Safe Activation has a free, built-in shopping cart. To process payments, you need a PayPal or Authorize.net merchant account or use ShipIt for free. Altenatively, a Buy button linked to PayPal, Amazon Simple Pay or Google Wallet can process the order and send data to Safe Activation to fulfill the purchase. Safe Activation is integrated with many external shopping carts. Setup your products and serial numbers in Safe Activation. Create a Product record for each product. Link it to a group of Serial Numbers for each product. Link it to a set of data fields to collect during activation. Setup order process to deliver Serial Numbers. Select payment processor to handle credit card transactions. Enable optional sales tax field and set tax rates. Enable shipping selections and set rates. Enable optional fixed or percentage discount codes. Customize Order Summary with data collected during order process. Setup advanced features to fully automate and customize the purchase process. Apply CSS styles, images and custom text to the shopping cart screens. Assign registered download URL to control number of downloads, expiration and IP addresses. Generate a customer personalized LicenseCard image for drag & drop activation. Run a custom script on your web site to store order data or automate other activities. Generate a customer account with secure login, order summary and license status. Create a Buy button for your website for each product you sell. Type product name and details, then Safe Activation generates HTML button code. Customize HTML button code or just paste it to any page on your website. Create Buy buttons for Affiliate websites where you process orders and they get commissions. Create Buy buttons for Reseller websites where they process orders and you bill reseller. Decide how you want the shopping cart to interface with your website. By default, when the customer clicks a Buy button, the shopping cart takes over to process the order. When the purchase is complete, it returns the customer to a page on your website. Alternatively, add one HTML tag to embed a separate web store page in a region of an existing web page. Create the store page with Buy buttons linked to the shopping cart. The customer never leaves your website to complete the purchase. When the setup process is complete, you are ready to sell products. Collect payments or issue refunds from PayPal or Authorize.net merchant account. Search and review the automated Order Summary from Transaction page on Safe Activation. 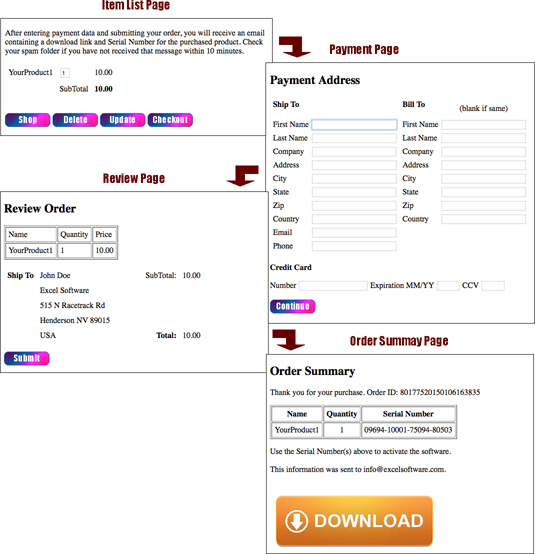 Generate manual Order Summary with Add button on Transaction page for phone, fax or email orders.